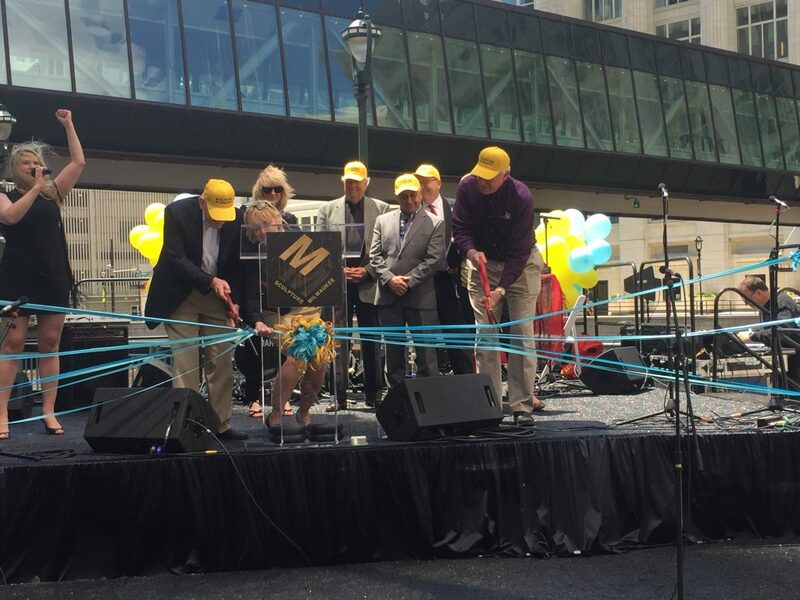 Opening of Sculpture Milwaukee in 2017. Photo by Jeramey Jannene. nationally and locally renowned artists. 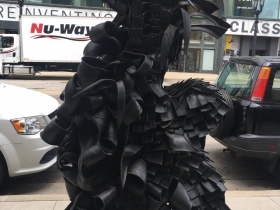 Polish artist Magdalena Abakanowicz, Los Angeles-based artist Liz Glynn, American artist Mel Kendrick, Milwaukee-based collaborators Shana McCaw and Brent Budsberg, New York-based artist Hank Willis Thomas, French artist Bernar Venet, and Austrian artist Erwin Wurm are among the featured artists in the 2018 installation. 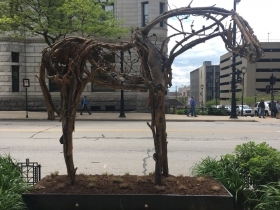 Sculpture Milwaukee will be on view from June to Oct. 21, 2018. Highlighted works confirmed to date include: Magdalena Abakanowicz’s The Group of Five, 2014; Liz Glynn’s Untitled (Burgher with extended arm), 2014; Mel Kendrick’s Marker #2, 2009; Shana McCaw and Brent Budsberg’s Skew, 2018; Hank Willis Thomas’ Liberty, 2015; Bernar Venet’s 97.5° Arc x 9, 2007; and Erwin Wurm’s Half Big Suit, 2016. 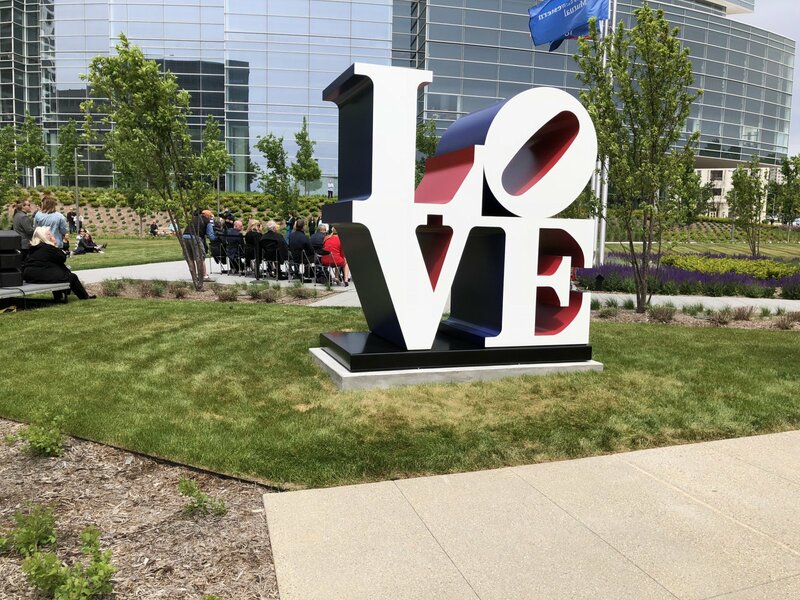 Led by Steve Marcus, chairman of the board of The Marcus Corporation, Sculpture Milwaukee is an annual gift to the community, bringing world-renowned works to an accessible and approachable environment for all to enjoy. 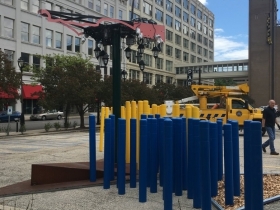 From art connoisseurs and collectors, to school children and office workers, the installation will spark imaginations and activate Wisconsin Avenue, from 6th Street on the west to O’Donnell Park on the east. Sculpture Milwaukee 2018 is curated by Russell Bowman, an art advisor based in Chicago and former director of the Milwaukee Art Museum, and Marilu Knode, Sculpture Milwaukee’s project director and former director of Laumeier Sculpture Park in St. Louis. Magdalena Abakanowicz is one of Poland’s most internationally acclaimed artists. Growing up under a Communist regime, Abakanowicz studied art when Socialist Realism was the only approved style. 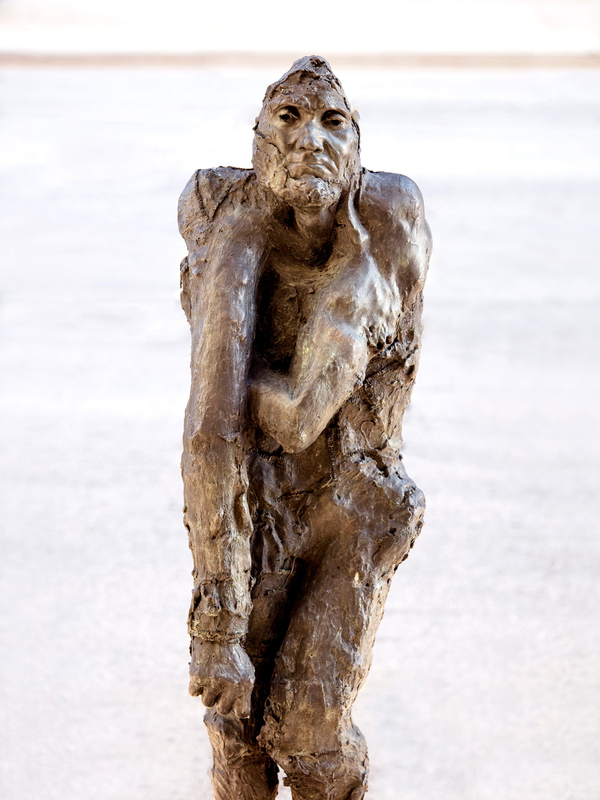 In turn, Abakanowicz sought ways to address her contemporary world without censorship. Abakanowicz’s headless bodies, a style she began using in the 1970s and 1980s, suggest the loss of individuality in the crowd, the transformation from unique human to mob – a transformation that has renewed presence in our contemporary polarized world. In addition to The Group of Five, 2014, the temporary work on loan to Sculpture Milwaukee, Abakanowicz has a permanent piece in downtown Milwaukee. Birds of Knowledge of Good and Evil, a public art sculpture commissioned by the Woman’s Club of Wisconsin Foundation in 2001, is located on the Kilbourn Avenue Boulevard at Prospect Avenue. The Group of Five, 2014 is on loan courtesy of the Richard Gray Gallery, Chicago. historical research to link our current world to our past. Everything is contemporary at one point in time. Glynn uses this premise to reimagine how individuals might help shape future outcomes through engagement and imagination. Untitled (Burgher with extended arm), 2014 comes from a series of performances focused on monumental sculptures in the collection of the Los Angeles County Museum of Art. Glynn and her crew cast molds from 19th century French artist August Rodin’s work The Burghers of Calais, 1884-89. Using Rodin’s own studio practice of fragmentation and recombination, Glynn creates unsettling versions of an already disquieting tableau. The disjointed figure speaks to the social and technological upheavals of our time, each person pulled in different directions by a constantly changing social and economic climate. Untitled (Burgher with extended arm), 2014 is on loan courtesy of the artist and the Paula Cooper Gallery, New York. Mel Kendrick, known primarily for his fragmented wood sculptures, has been cutting, slicing and boring through wood pieces since the early 1970s. In his Marker series, his first large-scale works done in concrete, Kendrick uses emphatic black and white banding. While seemingly decorative, the striations follow a long tradition of architectural marking that dates back to the Roman era. It is in the Marker series where Kendrick’s interest in architecture and the built environment are most evident. The scale of these works hover between body and building, between heavy and light, and between horizontal and vertical. The banding anchors the works to the street. The perforations and apertures allow viewers to see the sky through the work. Like a giant Rubik’s cube, Marker #2, 2009 encourages viewers to twist the shapes in their minds, rotating them around their central core, sliding the parts back into place. Kendrick evokes our experience of walking through the city, where each layer of a building façade, billboard or signage stacks upon one another, making and unmaking the visual environment through which we move. Marker #2, 2009 is on loan courtesy of the artist and the David Nolan Gallery, New York. Milwaukee-based collaborators Shana McCaw and Brent Budsberg have been exploring the different forms of American architecture built by immigrants, including their own ancestors. Noting the various shapes these buildings take after being abandoned, McCaw and Budsberg were inspired by the improbably organic shapes that barns take when they slump and shift under the weight of time and weather. Utilizing sheets of white pine from a fallen tree on the Budsberg family’s property in northern Wisconsin to create their modern-day “barn,” Skew, 2018 brings this unique geometry into the 21st century. 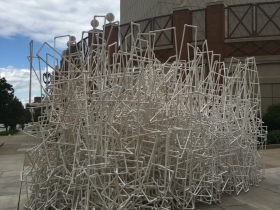 Skew, 2018 has been commissioned for Sculpture Milwaukee. New York-based artist Hank Willis Thomas explores how the media and popular culture shape identity and ideas of race. 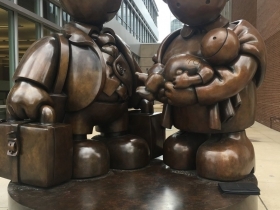 Through photography, sculpture, film, installations and public art works, Thomas appropriates recognizable imagery to critique how advertisements brand us. He works through popular clichés to expose the ways they shape how we see each other and ourselves. Originally presented in New York, the Public Art Fund describes Liberty, 2015 as “…a life-size, candy-coated bronze sculpture derived from a 1986 found photograph of a Harlem Globetrotter. He spins a basketball on his finger, in the likeness of the Statue of Liberty, which is featured in the background of the image. In a digital era where electronic devices mediate our viewing experiences, the three-dimensional arm, appropriated from the photograph, invites the viewer to consider the framing and context of the images that surround us.” Liberty, 2015 is on loan courtesy of the artist and the Jack Shainman Gallery, New York. straight, curved, broken or indeterminate – has remained a common thread throughout his 50-year career. Venet is a “systems” artist, using self-generated systems to drive the shape of his lines and arcs. Like many of the Minimalists of the 1960s and 1970s, Venet relinquishes authority over his creations, yet the clarity of his vision is what links the works together. 97.5° Arc x 9, 2007, is exactly as described – nine lines at a 97.5-degree arc bend in a permanent wind – the metal lines seeming pliant against the invisible forces of nature. His architectural-scaled arcs and lines resist the rigidity of building geometry. His works are more like slumped building infrastructure. Venet makes something hard look soft. 97.5° Arc x 9, 2007, is on loan courtesy of the artist and the Paul Kasmin Gallery, New York. Austrian artist Erwin Wurm is best known for his One Minute Sculptures, begun in 1996 – a set of objects (clothing, furniture, fruit) with simple instructions for audience interaction. While the actions themselves are more absurd than transformative, it is that gap – between meaningful gesture and futile act – that is at the heart of Wurm’s work. There is a melancholy to his familiar and hopeful objects, the artist encouraging us to still find value in the play of the everyday. Wurm also transforms real-world objects into monuments for the 21st century. In Half Big Suit, 2016, Wurm presents the ubiquitous business suit of the modern global economy – softened by pale pink pastel paint. This work shows cutthroat business culture transformed by changes in the workplace and a new embrace of a work-life balance characterized by a relaxed environment. Wurm’s Half Big Suit up-ends the traditional subjects of monuments – kings and generals – and celebrates instead everyone who shapes and populates our community. Half Big Suit, 2016, is on loan courtesy of the artist and Lehmann Maupin, New York and Hong Kong. 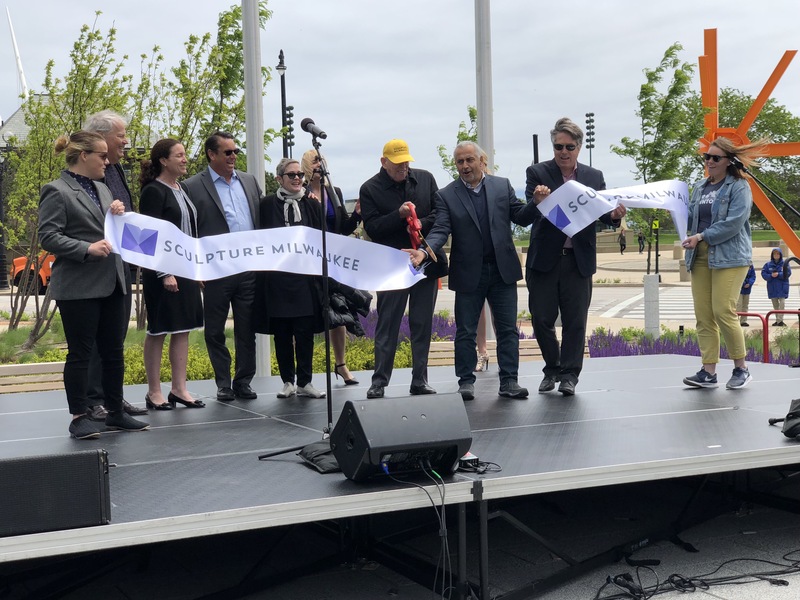 Debuted in 2017, Sculpture Milwaukee is the vision of Steve Marcus, a local philanthropist and chairman of the board of The Marcus Corporation. 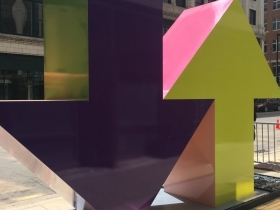 Milwaukee Downtown, Business Improvement District #21, a 501(c)(3) organization, serves as the administrative arm of the project with many Milwaukee organizations and institutions lending their support. This tremendous gift to the community is made possible through grants, in-kind donations and sponsorships. The exhibition’s inaugural year was organized by advisor Russell Bowman, former director of the Milwaukee Art Museum, and included 21 regional, national and international artists – Donald Baechler, Lynda Benglis, Chakaia Booker, Deborah Butterfield, Santiago Calatrava, Saint Clair Cemin, Tony Cragg, Jim Dine, Paul Druecke, Michelle Grabner, John Henry, Sol LeWitt, Dennis Oppenheim, Tom Otterness, Will Ryman, Alison Saar, Joel Shapiro, Jessica Stockholder, Tony Tasset, Manolo Valdes and Jason S. Yi. Sculpture Milwaukee 2018 is curated by Russell Bowman and Marilu Knode, Sculpture Milwaukee’s project director and former director of Laumeier Sculpture Park in St. Louis. For more information, visit www.sculpturemilwaukee.com or call 414.220.4700. Thank you Steve Marcus, all of the donors and Sculpture Milwaukee! Thank you Russell Bowman. These public works of art enliven Wisconsin Avenue and indeed make Milwaukee better. Can wait to see what is coming. I would like to echo JMac’s comments. A wonderful variety of sculptures were presented last year, and this year looks to be just as strong. I live downtown, and observed a number of people viewing and enjoying them. Genius idea.